Activation, or induced gamma ray spectroscopy, logs record concentrations of individual chemical elements derived from the characteristic energy levels of gamma rays emitted by a nucleus that has been activated by neutron bombardment. Pulsed neutron spectroscopy and elemental capture spectroscopy are other common names for this kind of log. Chlorine, oxygen activation, aluminum activation, and carbon oxygen logs also fall into this category, as well as the reservoir saturation tool (RST) since it combines a carbon oxygen log with a normal (non-spectrographic) pulsed neutron log into one device. These tools were designed to assist in assessing hydrocarbon content of the reservoir and were run through casing, where invasion was not usually an issue. Many of these tools are now obso;ete but may be found in older well files. Understanding their uses and limitations may provide useful clues to reservoir evaluation. 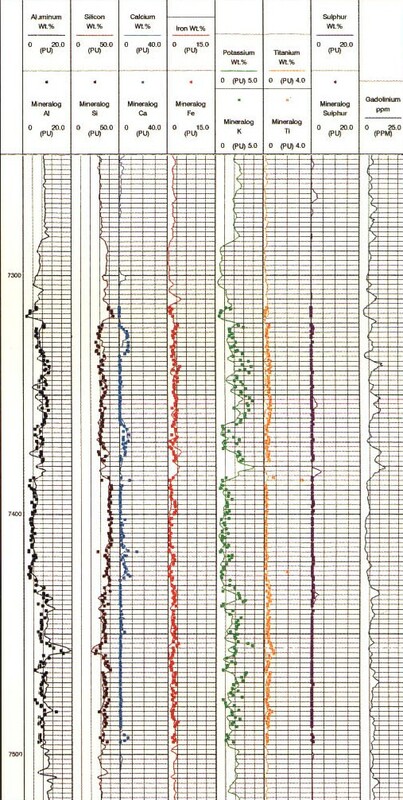 The geochemical log (GST) and its successor the elemental capture spectroscopy log (ECS) were primarily intended for mineral identification. The GST and ECS can be run in either cased or open hole. The first incarnation of an elemental capture spectroscopy log was the chlorine log. The recorded curve was a measure of the concentration of chlorine in the formation. High chlorine meant salt water in high to moderate porosity. Low chlorine meant hydrocarbon or fresh water or low porosity. By using the porosity log, we could sort out low porosity but sorting hydrocarbon from fresh water required local knowledge. This tool was rare, usually run through casing but open hole examples exist. The next incarnation of an elemental capture spectroscopy log was the carbon/oxygen log. It presented a log curve of carbon/oxygen capture ratio, a fraction (C/O) and silicon/calcium capture ratio (Si/Ca). High C/O indicate hydrocarbons as opposed to water and high Si meant sandstone as opposed to carbonate rocks. Shale and mudstone should have low C/O and low Si/Ca, except silty shale could have Moderate Si/Ca ratios. Count rates were measured in counts per minute instead of counts per second, so the tool had to be run very slowly as a through casing tool. It worked best in high porosity. Pulsed neutron spectroscopy log is a wireline log of the yields of different elements in the formation; measured using induced gamma ray spectroscopy with a pulsed neutron generator. The elemental yields are derived from two intermediate results: the inelastic and the capture spectrum. The inelastic spectrum is the basis for the carbon-oxygen log, and can also give information on other elements. The capture spectrum depends on many elements, mainly hydrogen, silicon, calcium, iron, sulfur and chlorine. Since the elemental yields give information only on the relative concentration of elements, they are normally given as ratios, such as C/O, Cl/H, Si/(Si + Ca), H/(Si + Ca) and Fe/(Si + Ca). 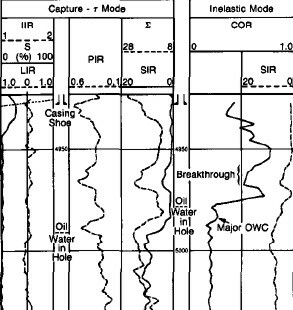 These ratios are indicators of oil, salinity, lithology, porosity and clay, respectively. The main purpose of the log is to determine lithology, the principal outputs are the relative yields of silicon, calcium, iron, sulfur, titanium and gadolinium. The yields give information only on the relative concentration of these elements. To get absolute elemental concentrations, it is necessary to calibrate to cores, or, more often, use a model such as the oxide-closure model. The depth of investigation of the log is several inches into the formation. It can be run in open or cased hole. Pulsed neutron spectroscopy logs were introduced in the mid 1970s after a decade or more of investigation. The geochemical log is a more recent incarnation and was run in cased hole as the GST tool and in open hole as the GLT tool (Schlumberger terminology). It is a log of elemental concentrations from which the geochemistry of the formation may be derived. Several different logs provide information on elemental weight concentrations: natural gamma ray spectroscopy, elemental capture spectroscopy or pulsed neutron spectroscopy, and aluminum activation. The combination of all of their outputs is known as a geochemical log, since it provides information on most of the principal elements found in sedimentary rocks. As for the pulsed neutron spectroscopy log, absolute concentrations can be derived by calibration to core or by using a model such as the oxide-closure model. The absolute elemental concentrations can then be converted into mineral concentrations using a model that defines what minerals are present. The first complete geochemical logs were run in the mid 1980s. The oxide-closure model for converting relative elemental yields from a pulsed neutron spectroscopy log to absolute weight concentrations uses the assumption that the sum of all oxides in the rock matrix is 1.00. The model is based on the observation that, with few exceptions, sedimentary minerals are oxides, so that the sum of the dry weight percent of all oxides must be 100%. The weight percent of an oxide can be calculated from the dry weight percent of the cation by knowing the chemical formula. Si = tool sensitivity to that element, measured in the laboratory. Qi = the oxide association factor, given by the chemical formula. Since the sum of all Wi equals 1.00, it is possible to calculate F and determine each Wi . 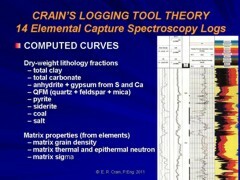 The elemental capture spectroscopy (ECS) log is the current version of activation logging. Unlike earlier versions it does not use a pulsed neutron source but uses instead a standard americium beryllium (AmBe) neutron source and a large bismuth germanate (BGO) detector to measure relative elemental yields based on neutron-induced capture gamma ray spectroscopy. The primary elements measured in both open and cased holes are for the formation elements silicon (Si), iron (Fe), calcium (Ca), sulfur (S), titanium (Ti), gadolinium (Gd), chlorine (Cl), barium (Ba), and hydrogen (H). Wellsite processing uses the 254-channel gamma ray energy spectrum to produce dry-weight elements, lithology, and matrix properties. The first step involves spectral deconvolution of the composite gamma ray energy spectrum by using a set of elemental standards to produce relative elemental yields. The relative yields are then converted to dry-weight elemental concentration logs for the elements Si, Fe, Ca, S, Ti, and Gd using the oxides closure method. Matrix properties and quantitative dry-weight lithologies are then calculated from the dry-weight elemental fractions using empirical relationships derived from an extensive core chemistry and mineralogy database. The reservoir saturation tool (RST) is a combination of a modern carbon oxygen log and a standard pulsed neutron log. The dual-detector spectrometry system of the through-tubing reservoir saturation tool enables the recording of carbon and oxygen and dual burst thermal decay time measurements during the same trip in the well. The carbon/oxygen (C/O) ratio is used to determine the formation oil saturation independent of the formation water salinity. This calculation is particularly helpful if the water salinity is low or unknown. If the salinity of the formation water is high, the dual burst thermal decay time measurement is used. A combination of both measurements can be used to detect and quantify the presence of injection water of a different salinity from that of the connate water. Weight percent curves from the ozide model for a GLT log. Computed lithology from oxide model, including porosity and hydrocarbon saturation from C/O ratio. Alternate analysis for lithology and chromostratigraphy.